Confounded by the vast array of options, many investors wish someone would just tell them exactly how to invest their portfolio. While SMI has always approached investing from more of a “buffet table” standpoint, where we present you with options and let you decide what you’d like on your plate, we’ve recognized this growing call for direction. In fact, this desire for a simple “default” recommendation for SMI readers was the driver behind the creation of our 50/40/10 portfolio. If you’re not familiar with this portfolio, we recommend clicking the link above to read the May 2014 cover article that explains it in detail. But as a quick overview, 50/40/10 refers to the percentages of a portfolio allocated between three SMI strategies: 50% to Dynamic Asset Allocation (DAA), 40% to Upgrading, and 10% to Sector Rotation. It’s a simple starting point that balances risk and reward in a way that we think is appropriate for most investors. One reason this approach can work for investors of different ages and personalities is there is a bit of flexibility built in via the Upgrading component. The 40% allocated to Upgrading is intended to be divided between stocks and bonds according to a person’s risk tolerance and season of life. This also allows the overall portfolio to become more conservative over time. While 50/40/10 is an appropriate starting point for many investors, it’s still true that one size doesn’t really fit all. Some investors will want a more aggressive portfolio, others will want a more conservative one. 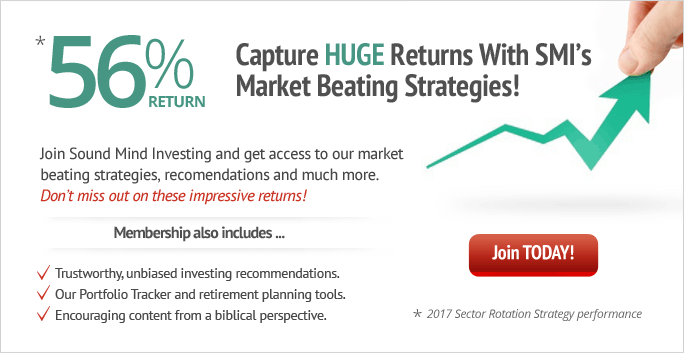 The goal of this article is to demonstrate how to tweak a 50/40/10 portfolio to fit your personal desires. To do this, we’re going to focus on a risk measure called “drawdown.” This is a concept that simply measures how far a strategy has declined from a prior high. So, as an example, if you start with a portfolio of $500 that grows to $1,000, then declines to $700 before moving up again, the drawdown of the portfolio was $300, or 30%. We’ve looked at each of SMI’s primary strategies over the past 20 years, beginning in 1996. For each one, we’ve identified the maximum percentage loss, or drawdown, from a prior high. 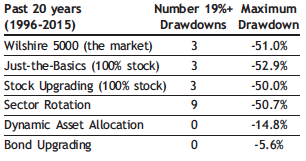 We’ve also identified how often each strategy had a drawdown of at least 19%. We used a loss of 19% as the cutoff — rather than a more conventional level such as 20% (the common definition of a bear market) — simply because Sector Rotation happened to have two drawdowns of more than 19% but less than 20%. We didn’t want to give the impression SR was less volatile than it really is by omitting those instances. It’s also worth noting that the data we used are month-end only, which means that in all likelihood, the maximum drawdowns would have been slightly worse if measured from the exact day of the actual peak to the exact day of the actual trough. Unfortunately, we don’t have daily data for the strategies going back 20 years. As the first four rows of the table clearly show, the all-stock indexes and strategies have historically been quite volatile. Each had a maximum drawdown of at least 50% (all of these occurred simultaneously during the 2008-09 financial crisis). And while Sector Rotation’s worst drawdown wasn’t significantly worse than the others, it made up for that fact by having a whopping nine episodes where it declined at least 19% from a prior high! That averages out to one significant decline almost every other year. In contrast to these 50%+ declines, DAA’s worst drawdown was only -14.8%. That’s a huge improvement compared to the all-stock strategies. It also scored particularly well in terms of the frequency of declines. The -11.2% drawdown DAA experienced between February-September of this year was only the second decline greater than -10% in the past 20 years. Not surprisingly, Bond Upgrading really distinguishes itself on the basis of this risk measure. Its maximum drawdown, which occurred earlier this year, was only -5.6%. Balancing out the significant volatility of a stock portfolio is a primary reason many investors own bonds in the first place, and this way of measuring risk shows why adding bonds to a stock portfolio is so effective. Comparing these strategies on the basis of maximum drawdown helps us arrange them on a “risk continuum” as shown below. This helps us easily visualize how a 50/40/10 portfolio can be modified to make it either more aggressive or more conservative. Think of each strategy shown there as a dial which can be turned up or down to provide the desired impact on the overall portfolio. For example, starting with the “middle of the road” 50/40/10 allocation, we could easily make the portfolio more aggressive by turning the Stock Upgrading or Sector Rotation dials up, while turning the DAA dial down. Taking 10% away from DAA and adding it to Upgrading would produce a slightly more aggressive 40/50/10 portfolio. An even more aggressive investor might take the 10% from DAA and add it to Sector Rotation to produce a 40/40/20 blend. On the other hand, making the default portfolio more conservative is as easy as turning the DAA dial up and either the Stock Upgrading or Sector Rotation dials down. Adding Bond Upgrading can also substantially dampen the portfolio’s volatility, though we encourage you to first consider increasing Bond Upgrading’s role within the 40% Upgrading portion before altering the 50/40/10 allocations. It may be that you can simply adjust your stock/bond allocation within Upgrading to achieve the overall portfolio risk level you desire. Circling back to where we began, the default 50/40/10 allocations are going to be suitable for most investors, and no one should feel any pressure to deviate from them. The modifications discussed here are strictly optional and should be employed only by those who specifically desire to shift the default portfolio toward either more or less risk. While it may be tempting to grab that Sector Rotation dial and crank it up based on its fantastic historical track record, don’t lose sight of those nearly every-other-year significant drawdowns. We recommend limiting SR to a maximum of 20% of the portfolio. You’re obviously free to disregard our warnings, but no tears later if you do! 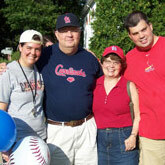 We’ve long maintained that there’s no reason to take more risk than necessary to meet your goals. The long-term (10-15 year) performance numbers for each strategy listed on the Performance tab of the SMI members homepage can give you an idea of how much risk you need to take. Don’t feel bad for not being more aggressive if you don’t need to be, but at the same time, remember Matt’s cautions from this June on The Risk of Playing It Too Safe. SMI has tried to respond to reader demand by creating a default portfolio appropriate for most readers. This can greatly simplify the process of getting started using our strategies because you no longer need to weigh the pros and cons of each strategy and determine which to use or how to best blend them together. But it’s good to know that as you get more familiar with the strategies, and with yourself as an investor, it’s easy to modify that default portfolio to fine-tune it to your personal liking. The tools are in your hands if you choose to use them.